Since the early 14th century, the Franciscans have kept August 19th as the feast of St Louis, bishop of Toulouse and son of Charles II of the royal house of Anjou. In the year 1285, when he was eleven, his father received the crown of Naples from the Pope, but at that time, was being held as a hostage by the King of Aragon. To obtain his freedom, Charles’ three sons, of whom Louis was the second, took his place, and were kept for seven years in the Franciscan house at Barcelona. Louis was deeply impressed by the Friars, so much so that he adopted their life as far as was possible for a man of rank being then held in honorable captivity. Two members of the community lived with him in his apartments, and he not only kept to their prayer regimen, but also undertook the study of philosophy and theology, preparatory to joining the order in fulfillment of a vow he had made during a serious illness. 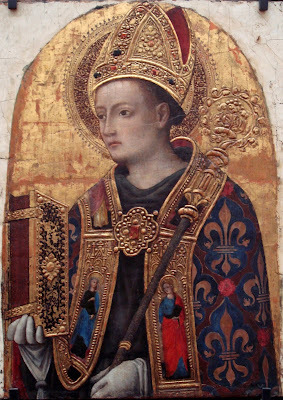 St Louis of Toulouse, by Antonio Vivarini, 1450. 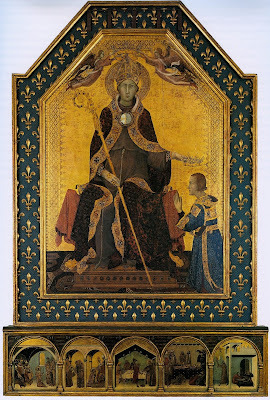 St Louis is represented in art as a young man in the robes of a bishop, but with the habit of a Franciscan underneath. In 1295, he was set free, but in that same year, his elder brother passed away, leaving him heir to the throne. 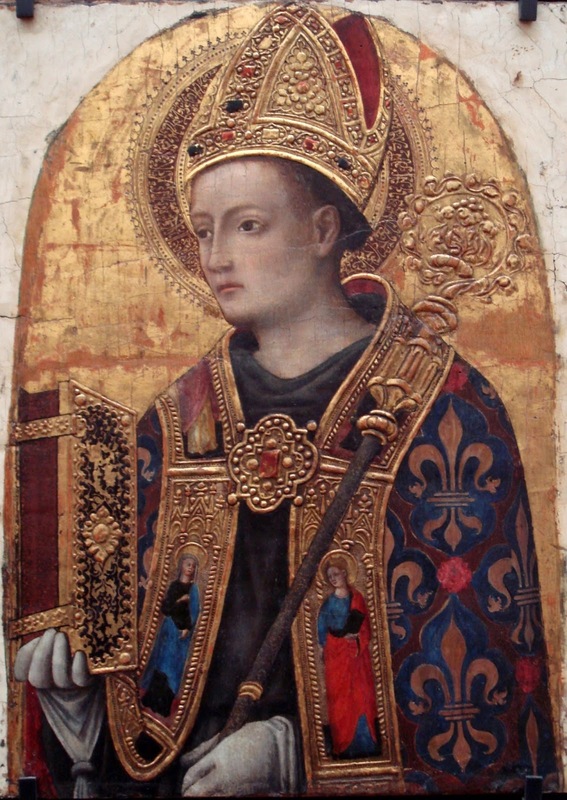 Like another famous nobleman before him, St Thomas Aquinas, Louis had to overcome significant opposition from his family in order to enter the religious life, and for a time, the Friars Minor dared not admit him. While living in a castle near Naples, he became a friend and benefactor to a scholar from France, one Jacques D’Euse, who later on, at the recommendation of his father, was appointed bishop of Fréjus in 1300. Before very long, Louis was able to abdicate his title in favor of his younger brother Roger, and follow the Poor Man of Assisi. For a variety of complicated political reasons, he was made not only a priest, but also bishop of the see of Toulouse in France, with a special dispensation granted by Pope Boniface VIII to receive these orders at the age of only twenty-three. A man of his position might very easily have followed the common bad practice of the era, and appointed a vicar to perform most of his episcopal duties; Louis chose not only to take personal possession of his see, but also to continue living the life of a poor friar, even wearing a old and patched up Franciscan habit, celebrating Mass daily, and preaching frequently. Like many holy men thrust into such positions of power, St Louis found the burdens of the episcopal office quite overwhelming, and expressed his desire to resign. His “resignation”, as it were, was accepted by God Himself, since St Louis died on August 19th, 1297, less than eight months after his episcopal consecration. In 1316, Jacques D’Euse, by then a Cardinal, was elected Pope, taking the name John XXII, and the following year, canonized his old friend and benefactor as a Saint. (He would also canonize St Thomas six years later, and towards the end of his reign, bring the Papal name “John” into bad odor with his heretical teachings on the Beatific Vision.) That same year, Louis’ brother King Robert, now known to history as “the Wise”, commissioned the altarpiece seen below from one of the best painters in Italy, Simone Martini; it is now in the Capodimonte Museum in Naples. In the main panel, St Louis himself is represented being crowned as a Saint by two angels, as he passes his earthly crown down to his brother. The predella shows a series of events from his life: Louis accepts nomination to the See of Toulouse; Louis takes his vows and is consecrated bishop; as bishop, he feeds the poor with his own hand at table; his funeral; Louis miraculous raises a dead child to life.